April 23, Dia de Sant Jordi — the traditional festival dedicated to books and roses — accounts for 5–8% of annual book sales in Catalonia. BARCELONA: In the early morning hours of the Dia de Sant Jordi, the Catalan festival dedicated to books and roses, hundreds of book and flower stalls are set up around the capital city of Barcelona, with a particular concentration on the Passeig de Gracia and the Rambla de Catalunya. 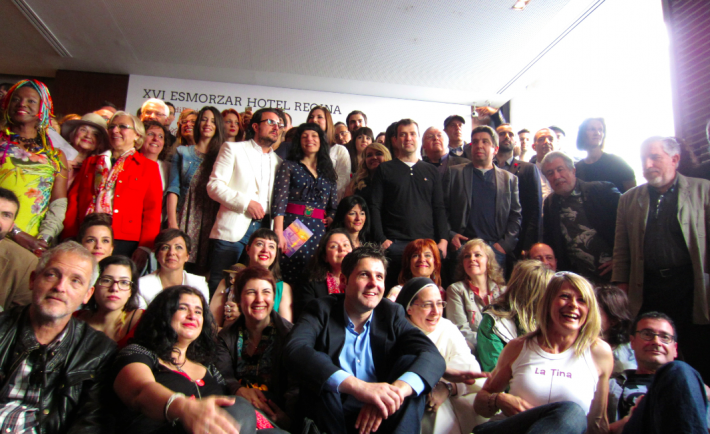 Each year on April 23rd Catalans pay homage to worldwide literature in cities and villages region-wide. Sant Jordi, or St. George, the patron saint of Catalunya was celebrated in the Middle Ages with lovers giving each other roses. In 1926, a Barcelona writer and editor, realizing that the date of Cervantes and Shakespeare’s deaths coincided with Sant Jordi’s, decided to launch the idea of giving books as well as roses to loved ones. The concept became so successful and enduring that 70 years later, inspired by the Catalan tradition, UNESCO declared April 23rd to be World Book and Copyright Day. Needless to say, Sant Jordi is a very important day for the publishing (and rose) industry. According to the Catalan Association of Booksellers, last year’s turnover was €19.2 million, representing 5–8% of total annual sales. 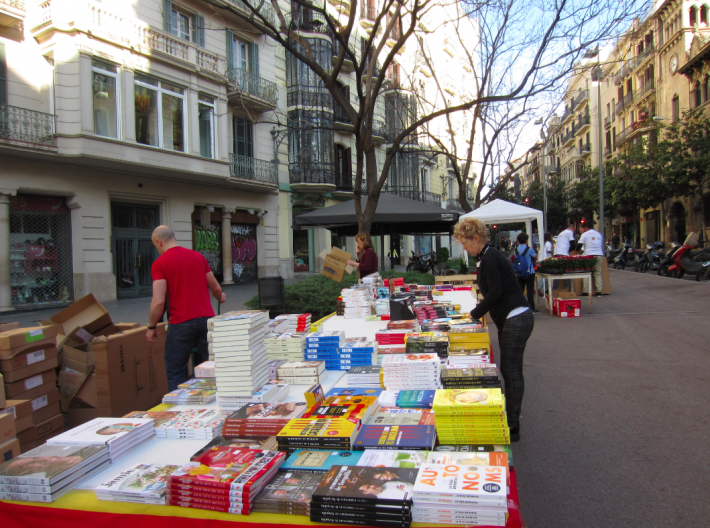 Sant Jordi is not an official holiday and publishers prefer it this way, in particular when it falls on a weekday, so that a maximum amount of people will buy books. Companies also give books as corporate and employee gifts for Sant Jordi, which is an extra boost to sales. “It’s a celebration about reading and books, a civilized and cooperative event,” said the Catalan Minister of Culture, Ferran Mascarell Canalda, who recounted that at age 11 his mother sent him out to buy his first book for Sant Jordi. He bought a book because of the beautiful woman on the cover, which turned out to be Stendhal’s The Red and the Black. A few years later he actually read it, and remains an avid reader, giving his friends a copy of his favorite book, Robert Musil’s The Man Without Qualities, every year. Jordi Sellas, who is Director General for Creation and Cultural Industries at the Ministry of Culture said that while 65% of Catalans read at least one book a year, he is working along with the Ministry of Education to encourage reading, a cooperative effort that includes booksellers, publishers, libraries and the media. Too Much of a Media Phenomenon? 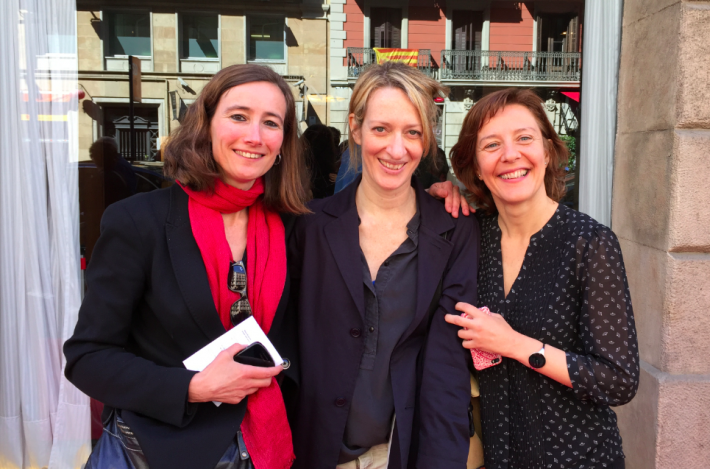 For the past five years literary and film agent Anna Soler-Pont, of Pontas Agency, has been inviting a handful of international authors and publishers that she represents or works with to Barcelona during Sant Jordi in order to strengthen relationships and show colleagues a good time. A week ago Barcelona presented its candidacy to become a UNESCO City of Literature. Besides providing inspiration to innumerable foreign authors and being one of the world’s publishing capitals (in both Spanish and Catalan), the city council cited Sant Jordi as an example of Barcelona’s great literary value. It is a day when local and international authors and publishers can truly feel the connection between their books and the readers thronging the streets.